You won’t find Headwaters on a municipal map. As a formal civic entity it doesn’t exist. But the rivers that rise within the disparate communities of Headwaters – and give the region its name – define our landscape, shape much of our thinking, and are the subject of discussion on front pages and in back rooms from local town halls to Queen’s Park to Parliament Hill. Here is a primer on the four major watersheds that rise right under our feet: the Humber, Credit, Grand and Nottawasaga, along with the smaller but significant Etobicoke and Mimico creeks. Years ago – I was in my teens – Dad and I used to drive up to these hills to fish for trout. 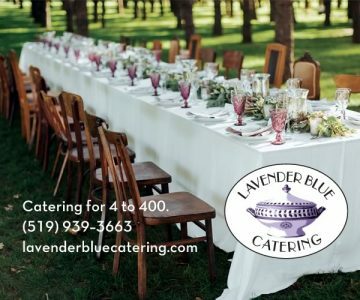 As soon as the melting snow started to run down the street toward spring, we spread topographical maps on the dining-room table, weighed down the corners and traced the course of the meandering streams. We looked for places where the blue lines crossed close-set contour lines and imagined deep pools below swift rapids or waterfalls. I was always impressed by the amount of blue on the maps. Now that I live in these hills, I am still awed by all the water. Drive along any road in town or country and you will not go far without crossing a culvert or bridge or seeing a swath of cattails and marsh marigolds at the side of the road. Sometimes you will see open water with little floating hearts – water lilies – and other aquatic plants. 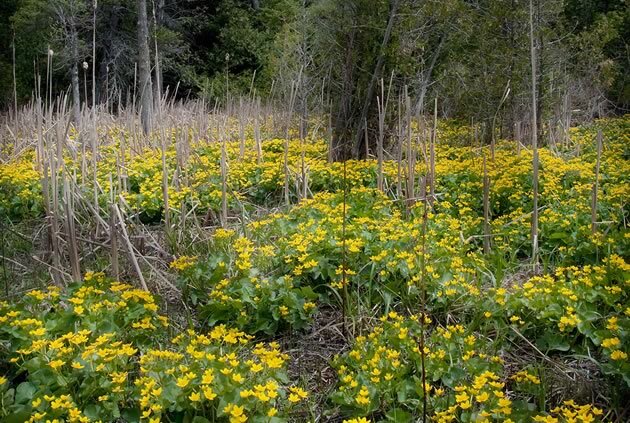 A spring riot of marsh marigolds in the wetlands of the Upper Credit in Caledon. Photo by Rosemary Hasner / Black Dog Creative Arts. Headwaters may not show up on municipal maps, but the word is certainly part of the local lexicon. The name gained currency when Mono Township hosted two well-attended conferences in the early 1990s. Focused on exploring how rural municipalities could protect groundwater from the threat posed by private septic systems, the conferences became known as Headwaters I and II. 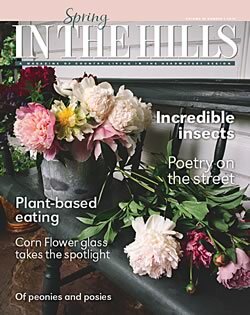 From that beginning the name caught on – and acquired its capital H. It is now used by many area organizations and institutions, including Headwaters Tourism, founded in 1994 to attract visitors to the 2,534-square-kilometre area encompassing Dufferin County and the towns of Caledon and Erin. Headwaters is now officially part of the York, Durham and Headwaters tourism region, one of 13 tourism regions recognized by the Ontario Ministry of Tourism, Culture and Sport. And it’s on the ministry’s tourism maps that you’ll find it. The Credit cascades over a small falls and rocks in Belfountain Conservation Area. Photo by Rosemary Hasner / Black Dog Creative Arts. The Grand River flows into Lake Erie, the Nottawasaga flows into Lake Huron via Georgian Bay, and the Humber and Credit, as well as Etobicoke and Mimico creeks, flow into Lake Ontario. But Headwaters can also lay claim, at least in some measure, to the headwaters of two other rivers. The main branch of the Saugeen River, which flows into Lake Huron, rises in northwest Melancthon Township, and the West Holland River rises in northeast Caledon and flows eastward to Lake Simcoe. So this region is home to the sources of eight rivers. Rushing water and rocky rills on the Nottawasaga River along Hockley Road. Photo by Rosemary Hasner / Black Dog Creative Arts. Name, which derives from Anishinabe words for “Iroquois” and “coming-out place,” refers to a battle at the mouth of the river between the Anishinabe and the Iroquois. Rises in Amaranth and Mono and flows 120 km into Georgian Bay at Wasaga Beach. Tributaries rise in Melancthon, Grey Highlands, New Tecumseth and northeast Caledon and include Innisfil, Boyne, Pine, Mad and Noisy rivers. Three branches cut through deep, wooded Hockley, Pine and Boyne valleys. Drains 3,300 sq km, of which 1,400 sq km are wetlands, including Minesing Swamp. Headwaters portion of watershed includes Pine River Provincial Fishing Area, Boyne Valley Provincial Park, Hockley Valley Provincial Nature Reserve and Mono Cliffs Provincial Park. Rare lake sturgeon is one of 75 fish species that spawn in the Nottawasaga. The East Credit River winds along the Trans Canada Trail between Kennedy Road and Highway 10 in Caledon. (Note: This location was incorrectly identified in the print edition.) Photo by Rosemary Hasner / Black Dog Creative Arts. Called Rivière au Crédite by French traders who did business at the river’s mouth with the Mississauga people, who called it Missinihe, “trusting water.” Both names refer to the French practice of extending credit to the Mississauga. Name later anglicized to Credit River. Main river rises near Orangeville, where two tributaries flow through town. A western branch rises in East Garafraxa. 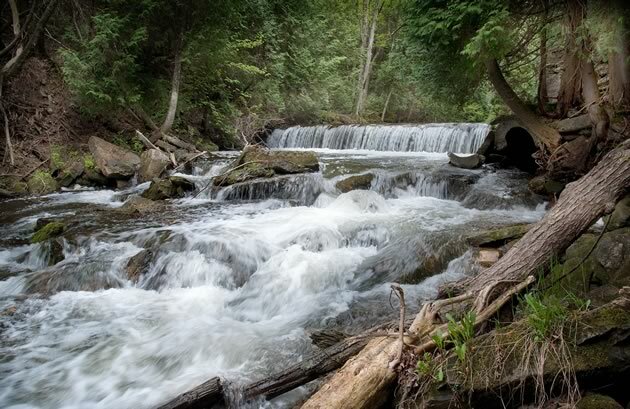 Several more tributaries, including Shaw’s Creek, Caledon Creek, and East and West Credit join as river flows 90 km to Lake Ontario at Port Credit. Drains an area of about 1,000 sq km. Encompasses 332 ha Island Lake Conservation Area, more than half of which is the lake formerly known as Orangeville Reservoir, but renamed for the Island family who originally settled there. The reservoir was created by two dams built nearly 50 years. Headwaters portion of watershed also includes Dragonfly Park, Elora Cataract Trailway, Belfountain Conservation Area, Ken Whillans Resource Management Area, Terra Cotta Conservation Area, Upper Credit Conservation Area, and Forks of the Credit Provincial Park. The Grand River winds through farmland just north of Grand Valley. Photo by Rosemary Hasner / Black Dog Creative Arts. Largest river located entirely in Southern Ontario. Main waterway rises north and east of Dundalk, but Black Creek, Willow Brook, Mud Creek and Butler Creek, as well as many unnamed tributaries, rise in Headwaters. Flows 290 km into Lake Erie at Port Maitland. Drains a total of about 7,000 sq km. Named a Canadian Heritage River in 1994. Encompasses 5,900 ha Luther Marsh Wildlife Management Area, one of Ontario’s most important wetlands and a vital stopover for migrating waterfowl. Birdwatchers have identified some 240 species. More than half, including least bittern, black tern and great egret, nest in the marsh. The Humber River flows through the remains of a mill dam in the heart of Bolton. Photo by Rosemary Hasner / Black Dog Creative Arts. Named for the Humber River in northeastern England. Anishinabe people called it Cobechenonk, “leave the canoes and go back” or “portage,” a name that related to the ancient Toronto Carrying Place Trail linking Lake Ontario to Lake Simcoe and Georgian Bay. Main and west branches rise in Mono and Caledon. Flows 126 km through Toronto to Lake Ontario. Drains more than 900 sq km. Named a Canadian Heritage River in 1999. Headwaters portion of watershed includes Albion Hills Conservation Area, first conservation area in Ontario. Also includes Glen Haffy Conservation Area, the 973 ha Bolton Resource Management Tract, an environmentally sensitive area, and the 306 ha Palgrave Forest and Wildlife Area. Names of both creeks derive from Algonkian words: Etobicoke from Wahdobekaug, which means “place where alders grow”; Mimico from Omimeca, which means “resting place of the wild pigeons,” a reference to the now extinct passenger pigeons that migrated through the area in flocks so dense that they darkened the sky. Various streams, brooks and creeks rise in the Oak Ridges Moraine in southwestern Caledon and feed into one of the two creeks. Both creeks empty into Lake Ontario. Etobicoke Creek is 59 km long; Mimico Creek stretches 33 km. Combined watersheds drain about 288 sq km. Newhouse Park in Snelgrove is the northern terminus of Etobicoke Creek Trail, which follows the creek through Brampton and Mississauga. Because of where I have lived for the past 30 years, most of my favourite places are in the Nottawasaga and Grand River watersheds, but there is water and beauty throughout the hills of Headwaters. In a good friend’s sugar bush in Caledon, for instance, a little creek meanders clear and cold between the trees and eventually makes its way into the Humber River. Fishing was my introduction to the rivers of Headwaters, but catching the fish was never important. Being near the water was – and is. When I walk through the trees down the hill to the river, I don’t leave the world behind; I find it. Please share your own favourite riverine places in the comments section below. The well-worn path that starts where the Second Line stops north of Mono Centre slopes gently downhill, past old stone walls and erratic boulders. Huge beech and maple trees, felled by ice and old age, are giving way to younger growth. Farther along the path from the viewing platform, a staircase, often called Jacob’s Ladder, descends between two rock faces – the cliff and an outlier – that split asunder some time long ago. You can see tiny ancient cedars growing out of cracks in the stone and prehistoric shellfish embedded in it. Along the base of the cliff, wetlands and ponds mark the source of this branch of the Nottawasaga River. Past the No Winter Maintenance sign and down a rough road, the valley glows in cool, soft green light under a canopy of basswood, beech and maple leaves. It has the feel of an ancient cathedral, with the sun shining on motes of dust in expectant silence. We stop in the quiet and listen to the tintinnabulation of tiny waterfalls. Little rivulets trickle out of the steep hills beside the road and flow into a small creek the road follows down to the Pine River, a tributary of the Nottawasaga. The sound it makes, plashing in tiny waterfalls, is magical. We used to live in Waldemar, across the road from the Grand River, where Willow Brook joins the main flow. There is a deep swimming hole at the juncture and the fishing can be good. I’ve seen bass, carp and pike in the Grand and speckled trout up Willow Brook. But the main attraction of this part of the river is its springtime power. When the snow melts, the Grand can rise three metres, almost up to the bridge at Station Street. Some years, I understand, it’s even higher. My wife Susan and I could sit in our living room and listen to the rush. Every once in a while, as a sheet of ice cracked against the bridge support, we would hear a muffled crash and feel a deep thrum. I always hoped to see the moment of breakup and imagined a wall of water lifting the ice, but it always happened when I wasn’t looking. Long before we moved from Toronto, Susan and I got off a bus at Primrose with packs on our backs and followed the Bruce Trail down one side of the Boyne Valley, up the other, and eventually over to Rock Hill Park where we camped for a while. Little did we know that we would live here one day. This is where the Bruce Trail crosses the Boyne River, a tributary of the Nottawasaga. At the crossing, boardwalks and bridges keep feet dry and attest to the hard work of the Bruce Trail volunteers. It’s a place to feel the ancient times, deep in the valley. The Nottawasaga, where Dad and I often fished, flows under these roads. We started at the bridges and worked our way upstream, casting bright spinners into the dark shadows where trout lurked. Sometimes in the quiet springtime pools, we could see schools of rainbow trout and suckers migrating upriver from Georgian Bay, but we rarely caught any. We tried everything. When we dabbled a worm down with the current or reeled a spinner up the flow, the fish all but ignored them. They would simply drift apart to make a path for the bait to go by. We used to live near the Pine River in Horning’s Mills. On the road going into the village, in front of a tumbledown house, a pond is all that remains of the concrete pools of a fish hatchery. This river flow begins in a pond behind this house, continues under the road and drops down into a large millpond. When Mr. Grey lived in the mansion on the shore, we called it Grey’s Pond. His home had originally been a hunting lodge owned by a group of Toronto businessmen. The walls were covered with mounted fish, moose and deer heads, and other trophies. Years ago, Mr. Grey invited us to fish there and we caught many speckled trout. In the centre of Horning’s Mills sits a house that was built astride the Pine. The people who lived there had a hatch in the kitchen floor and, so the story goes, used to catch fresh trout in the river below. In the 1930s, my father was a passenger in a truck bringing potatoes from Dufferin County to my grandfather’s produce business in Toronto. There was no bridge then. As it crossed the river on the ice, the truck skidded and broke an axle. Waiting for parts and repairs, they stayed overnight at the house. Dad remembered seeing the hatch in the floor. Someone had set mirrors in the bottom of the river so the trout stood out. The fish ladder in the Pine River Provincial Fishing Area. Photo by Rosemary Hasner / Black Dog Creative Arts. The Pine River is a tributary of the Nottawasaga, so rainbow trout – aka steelhead – make their way upriver from Georgian Bay to spawn. The river is dammed here, but there is a fish ladder to the large pond above. In the late 19th century, this was the millpond for two mills, and in the early 20th century, it was the site of a powerhouse that brought water-generated electricity to Horning’s Mills, Shelburne and part of Orangeville. When the powerhouse shut down, the place became the Horning’s Mills Fishing and Golf Club Reserve, a short-lived country retreat for wealthy businessmen. From Cataract to Belfountain, the Credit River tumbles over the Niagara Escarpment, flowing through breathtaking countryside. Dad and I used to stay overnight near the falls, pitching a tent or sleeping out in the open, so we could get an early start. We fished up and down the river from before dawn until mid-afternoon and rarely caught anything. But truth be told, it didn’t matter. We just wanted to be there among the trees and near the water. We saw owls in the night and deer in the morning mist, heard foxes yip and raccoons yowl, and listened to the sound of water tumbling over the rocks. On the way back from a day’s fishing, Dad and I would often stop at Glen Haffy late in the afternoon. It is where the Niagara Escarpment and the Oak Ridges Moraine meet and one branch of the Humber River begins. The spring-fed waters here stay cold enough for a resident population of speckled trout. Trails meander through mature forest and offer dramatic views from the tops of the hills, but it was the rainbow trout we were most interested in. Glen Haffy has a fish hatchery on site and when the trout mature they are released them into the ponds here and at Heart Lake Conservation Area in Caledon’s south end. When we were skunked elsewhere we could pretty well count on the stocked Glen Haffy ponds for a nice fat rainbow trout to take home! The Headwaters region perches on a height of land that began 500 million years ago when it was rock, not water, that flowed. Molten rock solidified to become what is now called the Algonquin Ridge, the foundation of the Niagara Escarpment. In ensuing eons, warm salt seas and freshwater lakes covered the area and laid down strata of coral, clay, sand and so on. Intervening glaciers compressed the layers into sandstone, limestone, shale and a combination of fossils and dolomite called dolostone. They also left behind deposits of sand, gravel, rocks and erratic boulders. The most recent glaciation, which ended about 11,000 years ago, covered the region in a sheet of ice that was 2,000 metres thick (more than a mile high) and weighed about 1.8 million kilograms per square metre. As the glacier melted, water eroded the land and carried off the softer layers of shale and sandstone, leaving behind the sharp dolostone and limestone cliffs, or scarps, of the Niagara Escarpment. The sharp edges and sheer cliffs were formed not by tectonic shift but by water flowing into cracks in the rocks. Carbonic acid in the rainwater dissolved the limestone, widening the joints. As the water froze, it expanded and split the rock as cleanly as a mason’s chisel and opened the way to the softer layers under the cap rock. When a mile-high glacier melts, it releases a lot of water, and many of our streams still follow ancient spillways. Now that the glaciers have receded, precipitation is an important source of the water in the rivers of Headwaters. When warm, moist air rises and cools, the moisture condenses into rain and snow. Because we live on a height of land, we get a lot of both: an annual average of nearly 900 millimetres in many parts of the region. The highest point in Headwaters is in the Dundalk Highlands, more than 540 metres above sea level. Compare this with Lake Erie, which is 174 metres above sea level and Lake Ontario, which is only about 75 metres. But not all the precipitation that falls on Headwaters goes into the region’s waterways, at least not right away. Some of it percolates into the aquifers deposited by glaciers and into an underground river called the Laurentian, which drained the region before the Great Lakes were formed. The Laurentian still flows from Wasaga Beach to High Park in Toronto as deep as 200 metres below the surface. As this groundwater returns to the surface through fissures and cracks in the escarpment, it feeds the rivers of Headwaters. About 50 per cent of the Credit’s flow, for example, comes from groundwater – a percentage that rises during periods of drought. 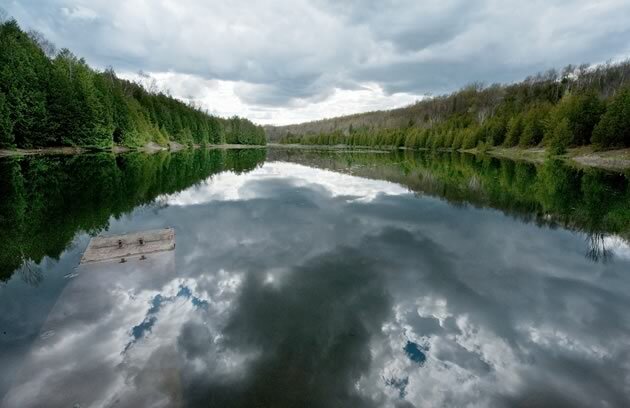 Clouds reflect in a serene stretch of the Pine River, a tributary of the Nottawasaga. Photo by Rosemary Hasner / Black Dog Creative Arts. When European settlers climbed these hills with their axes and ambition, they cleared the land for farming, sold the lumber and used the abundant water to power their mills. By the end of the 1800s, in Horning’s Mills alone, at least half a dozen mills were situated along the Pine River. The name Mill Street in many Headwaters’ towns and villages harks back to that era, and some communities even have the word “mill” in their name. Many stone skeletons of the old mills still stand along the region’s riverbanks, and some of the buildings have been restored to use, though no longer as mills. Notable among these are the Millcroft Inn and the Alton Mill Arts Centre. This early settlement activity marked the beginning of a decline in both the amount of water in the region’s rivers and its quality. Clearing the forests reduced the ability of the land to absorb precipitation and release it in a steady flow. It also increased the amount of silt, soil and livestock waste that washed into the rivers. Water caught in the millponds warmed up and raised the temperature of the rivers. As a result, some of the cold, clear gravelly streams became muddy, warm and polluted. Major events in the previous century reshaped thinking and the way Headwaters’ watersheds are treated. By the turn of the 20th century, the market for lumber had stripped much of the region of its forests. As early as 1905, some municipal leaders in Headwaters began to realize the importance of tree cover, and efforts to reforest the region accelerated through the 20th century. The first tract of land for what would become the Dufferin County Forest, for example, was purchased in 1930. Then, in October 1954, Hurricane Hazel dropped nearly a third of the average annual precipitation on parts of these hills. Widespread flooding and damage occurred in communities such as Grand Valley, Orangeville, Bolton and Snelgrove, where 214 millimetres of rain fell in 48 hours. 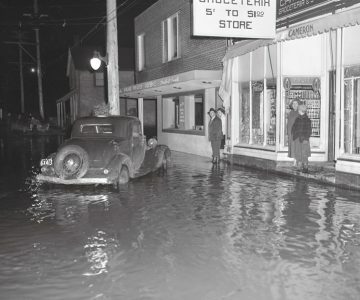 But the damage downstream was much greater, especially along the Humber River in Toronto and parts of York Region. Eighty-one people died and nearly 1,900 were left homeless. Among the dead was Shelburne businessman Walter Gamble, who had been on his way home from Toronto via Woodbridge when his truck stalled on a bridge over the Humber. Gamble, his aunt and a would-be rescuer were swept away in the torrent. 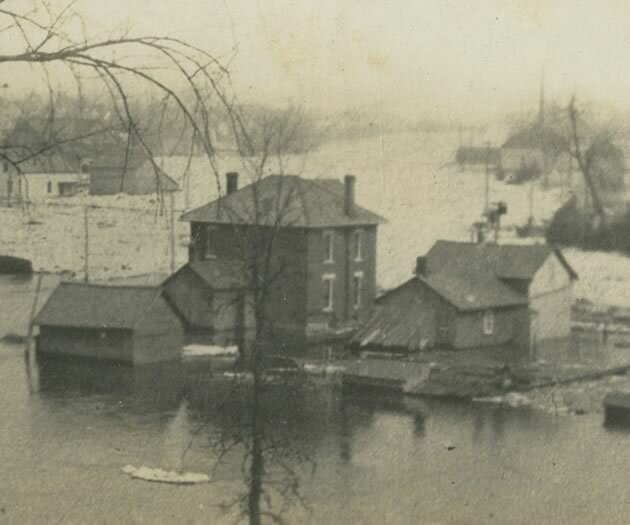 Although some conservation authorities had existed before Hazel, the storm and its aftermath prompted an expansion of both their mandate and number. 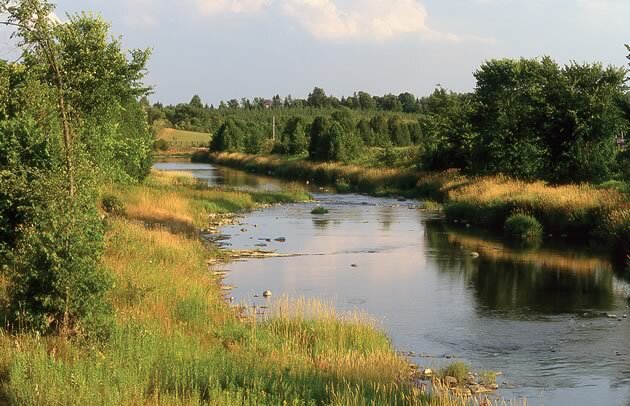 Today, the Grand River Conservation Authority, the Nottawasaga Valley Conservation Authority, Credit Valley Conservation and the Toronto and Region Conservation Authority (as well as the Saugeen Valley Conservation Authority in a northern corner of Melancthon), protect and manage the flora and fauna of Headwaters, as well as the amount and quality of water in both the rivers and groundwater. Their goal is not only to husband what is there now, but also to expand and improve upon it. The quality of municipal drinking water came into sharp focus after the contaminated water tragedy in Walkerton in 2000. In 2006 the Ontario government brought in the Clean Water Act, which strengthened the regulatory framework that governs how municipalities safeguard drinking water. In these hills, most drinking water comes from underground, which means we must protect not only the aquifers but also the recharge areas, where surface water percolates into the soil to replenish the underground supply – all the swamps, fens, bogs, marshes and ponds, as well as open meadows and forests. Today, more and more people are moving into the region. In preparation, developers cut down trees, scrape off the topsoil, reshape the natural contours of the land, and cover meadows and forests with roofs, roads and driveways. This means that rainfall, which once fed the waterways in a measured flow, becomes destructive. Unless it is properly controlled, stormwater is a spate that quickly floods streams, carrying with it earth, silt and the detritus of human habitation. Today, many streams and rivers contend with a cycle of floods and droughts, made worse by the increasing severity and frequency of storms caused by global climate change. Canadians consume more water than most other people on Earth. According to Statistics Canada, every Canadian uses 251 litres of water every day. Our volume of use is second only to that of Americans and double that of the average European. Though household water in parts of Caledon, including Bolton, comes from Lake Ontario through the South Peel Drinking Water System, elsewhere in Headwaters, residents get their water from either municipal or private wells that tap into underground aquifers. But these sources are increasingly at risk. Without meadows and wetlands to hold surface water and allow it to percolate down to the aquifers and other underground reservoirs, precipitation quickly flows off the land into the rivers, and the underground water supply is depleted. This past winter, dump trucks, excavators and backhoes invaded Mill Creek in Orangeville. 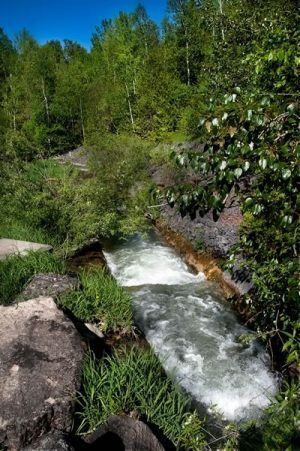 The town, in partnership with Credit Valley Conservation, the Greg Clark Chapter of Trout Unlimited Canada and the Izaak Walton Fly Fishing Club, finally completed a project that had been under consideration for many years. 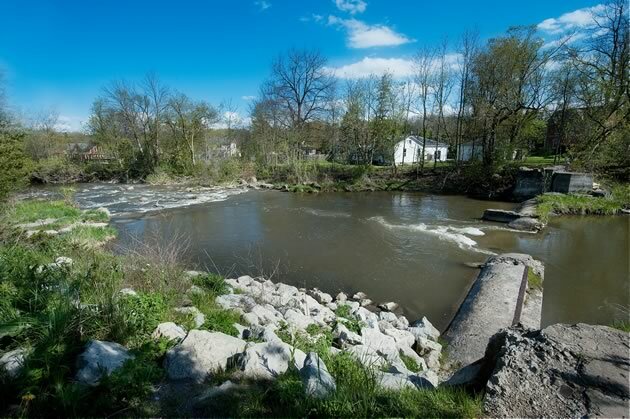 From Bythia Street to Townline, the heavy equipment scoured the silt and muck out of the riverbed, reshaped the banks, and set large stones and gravel into the banks and riverbed to control erosion and create the little riffles and deep pools favoured by fish. Karen Morrison, who grew up in Orangeville and often played in the creek, remembers the trout. “We used to pole a little flat-bottomed boat along part of it,” she said. 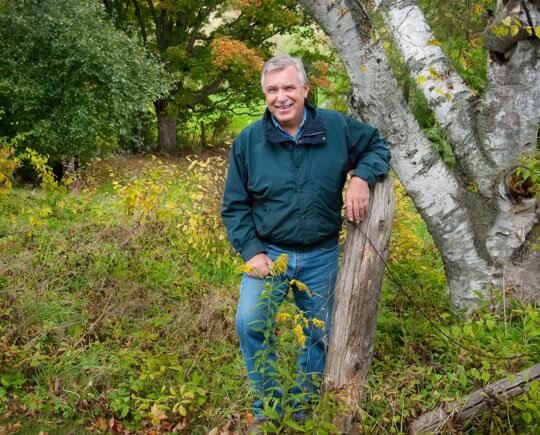 Morrison is now a member of the Headwaters Streams Committee for the Town of Mono. 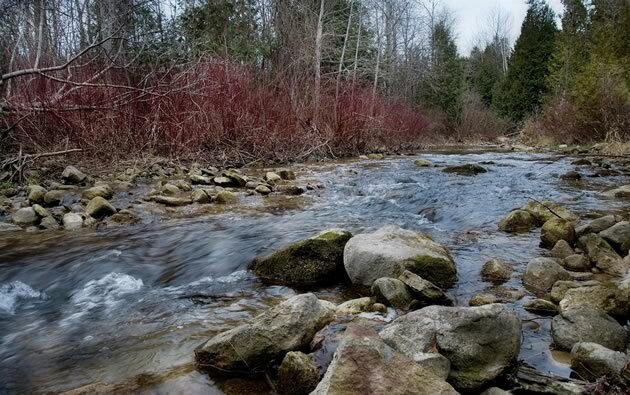 This committee has undertaken many projects in the headwaters of the Nottawasaga, such as rehabilitating Baker Creek and planting 700 mixed native shrubs behind the Headwaters Tourism office on Hockley Road. “The water was heating up,” said Morrison. “They call it thermal pollution, but farther upstream it was cold and there were crayfish and brook trout.” More of that cold water can now flow into the Nottawasaga. Like Morrison, volunteers across Headwaters don waders and wellingtons and fan out across the watersheds every year. As both individual volunteers and members of groups, they clean up garbage, plant trees, set out plants and carry buckets of little fish to small streams. Sometimes they organize protests. They attend meetings, write letters and make presentations to try to keep decision makers on their toes and policy makers focused on what is important. Often, they work in co-operation with other organizations that share an interest in achieving specific goals. At the centre of these efforts is a dedicated core of people who work year in and year out to protect, maintain and restore Headwaters’ natural heritage. These groups can always use more help. If you would like to lend a hand, or are looking for advice about water on your own property, here are some of the groups, large and small, whose work is essential to the watersheds of Headwaters. Conservation authorities play a leading role in protecting and enhancing their respective watersheds. Though programs vary from one authority to another, all offer assistance to private property owners. This help can take the form of grants or hands-on help with projects such as well capping or upgrading, fencing to keep livestock out of headwater streams, wetland restoration, tree planting and more. In partnership with CVC, for example, the Scott Mission Camp in Caledon has planted more than 9,000 trees and shrubs on its property over many years. Today, some of the earliest trees planted have grown quite tall and completely changed the look of the property – and this is just one of many similar projects across the region. Throughout Headwaters dams have been removed or taken offline, riparian borders have been expanded along streams and brooks, and both water quality and quantity have improved. A good indication of the success of these steps might be the re-establishment of the Atlantic salmon in the Credit and Humber rivers. Central to the effort to re-establish Atlantic salmon and other fish, such as rainbow and brook or speckled trout, are groups such as the Islington Sportsmen’s Club, the Ontario Steelheaders and the Nottawasaga Steelheaders. In addition, groups such as the Humber Valley Heritage Trail Association work closely with conservation authorities to rehabilitate and conserve watersheds. 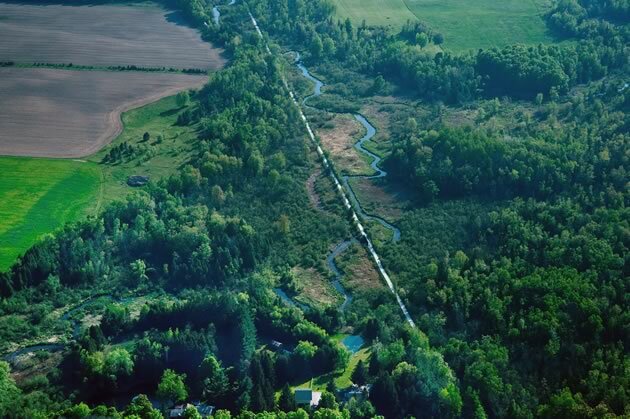 The Ontario Headwaters Institute is an example of a province-wide registered charity that works to protect headwater areas and the health of downstream watersheds. Located on the Alton Mill Arts Centre property in Caledon, the millpond was created well over a century ago by damming Shaw’s Creek to power what was then the Beaver Knitting Mill. The dam created a barrier to fish migration and warmed the water. Now the pond is silting in and exposed to contaminated stormwater from the municipal sewage system. Established in 2009, the millpond committee’s goal is to restore the pond at the same time as creating a bypass to cool the water in the creek so it is more welcoming for coldwater fish. The Ontario government has introduced its ideas for legislation based on the recommendations of David Crombie’s advisory panel for the Co-ordinated Land Use Planning Review. Among the far-reaching recommendations are those that will have a significant impact on management and preservation of our local headwaters. The public has until the end of September to comment and legislation will follow sometime later. Queen’s Park is also reviewing the Conservation Authorities Act and writing a wetlands strategy, although they have set no deadlines as yet. Change is coming and many feel it is about time. Introduce more specific regulations and standardize criteria related to development, watercourse protection and interference with wetlands. Not only does the Grand River lay out nature’s beauty, it also offers opportunities for recreation, commerce and development. Yet all this comes at a cost, for the Grand can be both friend and foe. This is a tremendously informative survey of local rivers! I’m sure I’ll be referring back to it often in the future. 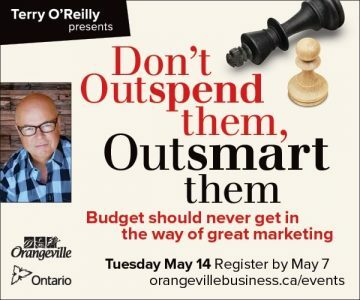 One small quibble-in the list of locales where Nottawasaga tributaries originate I would include Mulmur Twp as I believe from topographical maps that Sheldon Creek arises there in a wetland just up from Hwy 89 on the east side of Mulmur 2nd Line E. Thanks for great article, Tony!